In a large bowl, toss all ingredient except the cherry tomatoes with Olio Italian Herb Olive Oil, Olio Himalayan Pink Sea Salt, pepper and herbs to coat. Transfer vegetables to two baking sheets and arrange evenly. Bake until the carrots are tender and vegetables are beginning to brown, about 20 minutes (give them a stir after 10 minutes). Cook pasta in a large pot of boiling salted water until al dente. Reserve 1 cup of pasta water. Drain the pasta. 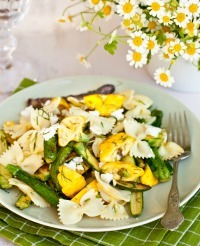 Toss the pasta with the vegetable mixture, including all the oil and juices. Add the cherry tomatoes and reserved water, as needed to moisten. Season with salt and pepper, to taste.